“Manistee Surf Cam” is a webcam on a bluff overlooking Lake Michigan about a mile north of 5th Avenue Beach in Manistee. The camera provides a real time view of Lake Michigan, the Manistee 5th avenue beach, historic pier, lighthouse and catwalk. The webcam is used by fishermen, boaters, beachgoers, tourists, surfers, and the homesick 🙂 to check Lake Michigan and beach weather conditions. The camera pans, tilts, and zooms to capture spectacular sunsets, waves, ships, and storms rolling in from The Big Lake. Nature enthusiasts will see seagulls, ducks, and the occasional fox(check the gallery). If you enjoy the view please share with your friends and “Like us” on Facebook page to stay updated on the Big Lake. Can you surf on Lake Michigan? Absolutely!!! And Manistee is an excellent but relatively unknown spot for surfing. 1st street beach on a North wind is one of the best locations on Lake Michigan with some of the cleanest breaks on the lakeshore. No salt, no sharks, what’s not to love?!? There are also several nice locations for a southerly wind surfing such as 5th avenue beach, Orchard Beach State Park, “The Cut”, and areas in between. 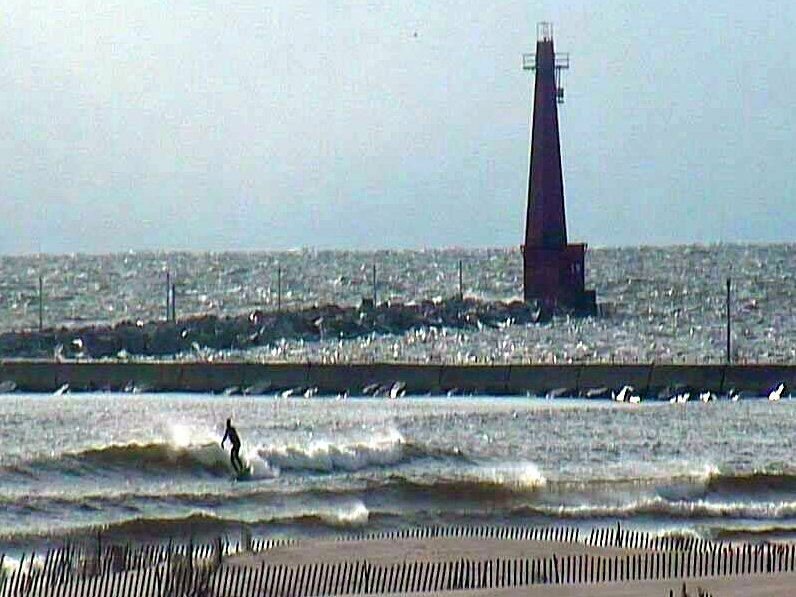 Surfable waves can be found in areas covered by the Manistee Surf Cam when the wind is not strong enough to create waves in Frankfort. If you are interested in great lakes water sports a good resource is Michigan Dawn Patrol. Hope to see you on the water! Contact us with questions, comments or suggestions. Manistee Lake Michigan Surf Cam © 2019. All Rights Reserved.